"They feast on your fear - and it's dinner time." 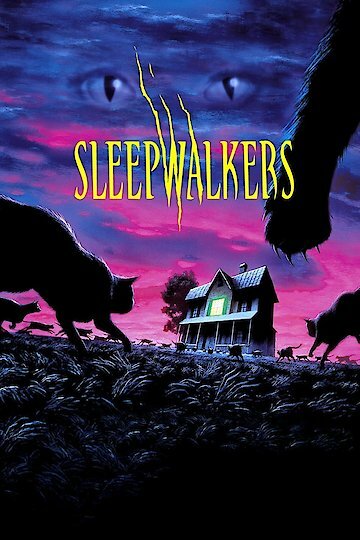 Sleepwalkers is a 1992 movie based on a story by Stephen King and centers on a son and mother who are nomadic shape shifters who have feline and human origins. They are known as Sleepwalkers and feed off of the souls of virgins. The only thing that can kill them for sure is the deadly scratch of a cat. Enter virgin Tanya, and the mother-son team is in business and trying to get her alone to drink her life-force. Tanya is working at the local theatre when Charles Brady comes in to see the double feature. Tanya is instantly smitten, having no idea that Charles is actually a killer. Charles' mother, Mary Brady, is hungry and wants to be fed. On the way home, Charles is stopped by one of his teachers who tries to blackmail him since he knows that the story Charles invented for him and his mom moving there isn’t true. Charles kills him and goes on the run from the law, getting away by making his car invisible and then changing the color when the law is no longer on his tail. When he gets home, his mother wants to know where food is. He tells her his story and that food will be coming tomorrow. Mary shudders as she sees the cats starting to collect in the front yard, knowing that they have come for her and her son. What follows is an attempt of the sleepwalkers to steal Tanya’s virginal soul for food that is thwarted by not only Tanya herself but the local police, as well . As the cats collect all around the house, people die trying to protect Tanya from something that they don’t even understand. The Bradys are more than determined to kill Tanya before they have to move on to greener pastures and do everything in their power to keep her. Sleepwalkers is currently available to watch free on Crackle and stream, download, buy on demand at Vudu, FandangoNow, iTunes, YouTube VOD online.